At the restaurant where I work, we always have a soup de jour. If you don’t know what soup de jour is, watch Dumb and Dumber—my friend Flo will fill you in. A few weeks ago the cooks made gazpacho and I fell in love. Hot soup isn’t always appealing in the summer (especially in Southern California), so this was perfect. The cool crunch of the vegetables and cold tomato juice is super refreshing on a hot day. 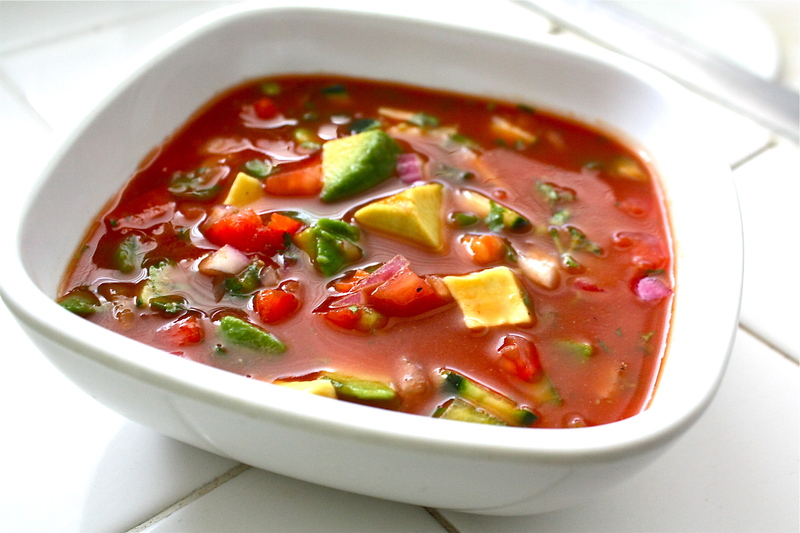 A bowl of this gazpacho could cure even Lana Del Rey’s summertime sadness—it’s amazing. There’s a ton of ways to make gazpacho (I’ve even seen recipes using watermelon), but I got the cooks’ recipe and went with their version. It’s a really simple and fast process, so it’s a good go-to recipe when you want something quick. Basically, you just chop up all the vegetables, dump everything in a pot, pop it in the fridge, and bam—ya done. Pour the tomato juice and water into a large pot and stir to combine. I like to use a 2:1 ratio of tomato juice to water to cut down the saltiness of the tomato juice. Next, chop up all your vegetables into bite-size pieces. I like my gazpacho to be nice and chunky, so I didn’t dice them too small. Add the lemon juice, ketchup, and freshly chopped cilantro. Season with salt and pepper to taste and add hot sauce (if you’re going that route). Give it one last stir and pop in the fridge. Serve cold. As always, feel free to eliminate, add, or cut down on any of the vegetables. *This recipe serves a lot of people. If making for yourself or a small number of people, I suggest cutting the recipe in half.